RIYADH- Temenos the banking software company has announced that Al Rajhi Bank, Saudi Arabia’s second largest bank and the world’s largest Islamic bank with total assets of over $97bn, has chosen Temenos to power its digital transformation journey and enhance its Islamic lending and financing product capabilities. The bank has opted for a complete renovation using Temenos T24 Transact as well as a host of additional digital solutions including Temenos Infinity and Temenos Loan Origination product. 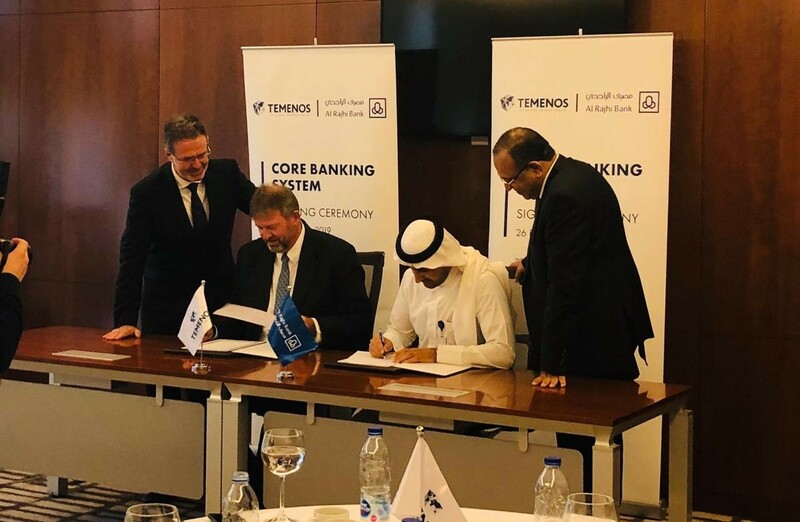 The signing ceremony, which took place in Riyadh on February 26, was attended by Mr. Waleed Al Mogbel, Deputy CEO at Al Rajhi, Colin Jarrett, Head of Global Development at Temenos, and Jean-Paul Mergeai, Managing Director Middle East & Africa at Temenons. Headquartered in Riyadh, Saudi Arabia, and with a network over more than 570 branches, Al Rajhi Bank chose Temenos to replace its lending systems after a rigorous competitive evaluation. Implementing Temenos software will enable the bank to introduce new lending products to the market and servicing its growing number of customers more quickly and efficiently. The new solution will also support Al Rajhi Bank’s growth ambitions and its vision to bridge the gap between modern financial demands and intrinsic Islamic values, whilst spearheading numerous industry standards and development. The bank, one of the most progressive banks in the Kingdom of Saudi Arabia, with a strong focus on customer-centricity, will also be able to offer market-leading products and services to its customers through enhanced digital channels. The award-winning Temenos’ Islamic Banking Suite coupled with its Saudi Model Bank application which includes global best practices and pre-configured local functions, will enable Al Rajhi Bank to cater for the specific Saudi regulatory requirements with a very short time and fewer efforts. The bank operates in more than 570 branches across Saudi Arabia as well as in Kuwait, Jordan, and Malaysia. The bank will leverage Temenos’ global expertise and 25 years of experience in providing integrated, scalable packaged software, as well as Temenos’ continuous investment in R&D, which is 20% of revenues – the highest in the industry.